The other day, I stumbled upon a great idea turned to reality. Justin Gignac, a NYC based artist and entrepreneur bet his friend that he could sell anything as long as the packaging was cool enough. And what better to prove his point than to sell garbage. From there he invented some really cool packaging and a marketing hook and after selling a ridiculous amount of glass enclosed cubed trash to numerous countries through out the world, the bet was settled. 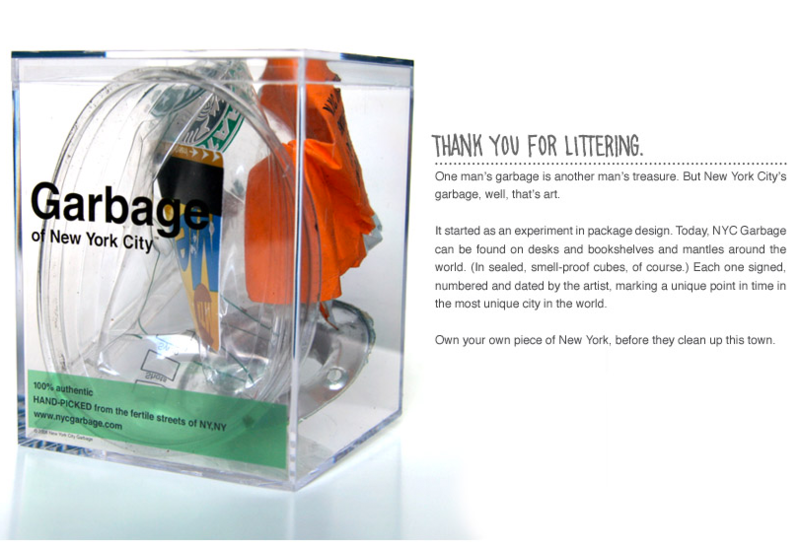 Anyway, the site is nycgarbage.com. I really like this idea and have been trying to come up with my own take on it. NYC tap water is suppose to be some of the best in the world right? Maybe I can create a bottled water brand that uses NYC tap water called, ‘TAPPED’. Each bottle comes with a unique story where a New Yorker describes something they saw in on the streets of NYC where the person that did it had to be completely ‘tapped’ to do. Crowd sourcing plus NYC hype plus cool packaging… not terrible.